This is Gracie, an amazing three-year-old in Amarillo that THERAPY 2000 provides both speech and physical therapy services. Gracie was born with a very rare condition called Birk-Barel syndrome which is characterized by intellectual disability, hypotonia, hyperactivity, and unusual facial features. She had severe feeding issues and airway difficulties at birth but has already been discharged from feeding therapy because she has met all her goals. Gracie, her family and her feeding/speech therapist, Val Betts, worked very hard and now she can enjoy a meal with her family. Gracie’s diagnosis places her at one of only twenty-five in the world and the only one in Texas with the condition. Kristy, Gracie’s mom along with her dad and three older siblings feel she has the special gift of bringing all of them even closer together since she was born. Gracie’s parents were told about T2K in Amarillo from one of her many professionals she sees in Dallas. Dr. Elizabeth Sperry of the International Craniofacial Institute had seen a lot of success with her patients she had referred to T2K in the Dallas/Ft. Worth area over the years. Gracie had her first of many surgeries at five weeks of age in Dallas and has had numerous returning trips over her three short years. She is a very hard working, happy and social little girl that enriches everyone’s lives that have the pleasure of meeting her! She currently receives PT services with Ashleigh Wilson and ST services with Val Betts. Gracie loves them both. Her mom Kristy says they both therapists are very loving but push her to work hard to reach her goals. She also says they are like family and genuinely care about Gracie. Mom states from day one the therapists really listened to her and took the time to “learn and speak Gracie”. They have cried together, shared in their struggles and celebrated all of her many achievements. Kristy said parents of children with special needs, appreciate a therapist who will share in their hope and not focus on what they can’t do but in what they CAN do. She loves that Val and Ashleigh continue to provide new ideas and are always “thinking outside the box” as that is how Gracie thrives. The family was thrilled that Gracie’s very rare diagnosis did not scare the therapists in any way with such little research out there and they never said “we can’t”. 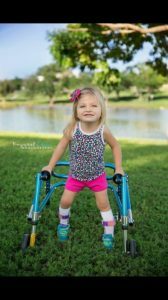 The family was told Gracie would never walk or talk when she was born and in the short time with the T2K therapists, she has started walking and running alone as well as increasing her vocabulary to more than 30 words. Gracie’s mom states that she would recommend T2K for a variety of reasons. First, because they have knowledgeable, experienced and caring therapists. Secondly, because the services are provided in the home it reduces family stress. Gracie is in her home environment and spends less time in the car with the family’s busy schedule. Third, it helped the family recognize safety issues in the home that they had not consider< And last but not least, the therapists encouraged the family to enroll Gracie into a mother’s day out program. This was something the family would have not ever considered and Gracie has flourished! Val was able to suggest accommodations at the mother’s day out program with her feeding issues and Ashleigh was able to suggest independent motor activities that they would have never known about otherwise. Gracie’s family is so grateful for T2K and what a huge difference it has made in their lives!